In times past birthday celebrations always involved expensive restaurants. We enjoyed the luxury of a good meal while someone else cooked, cleaned and served. I loved it then and when the time is right I still do. But, as we pare down to the essentials of what makes us happy, we’re circling back to the old joys of coming together in the new/old ways I mentioned in my previous post. Last week we celebrated our special birthday girl’s 29th year in grand style. Not in a 4 star restaurant, but gathered around the kitchen island – laughing, sharing, cooking, sipping, eating, eating, eating and talking about important issues. Wow! If we’d had time to throw in a board game, it would have been perfect. How great is it when you go to the mailbox and mixed in with the bills, political ads and offers for credit cards you find THE KEY. The key means you have a box waiting. 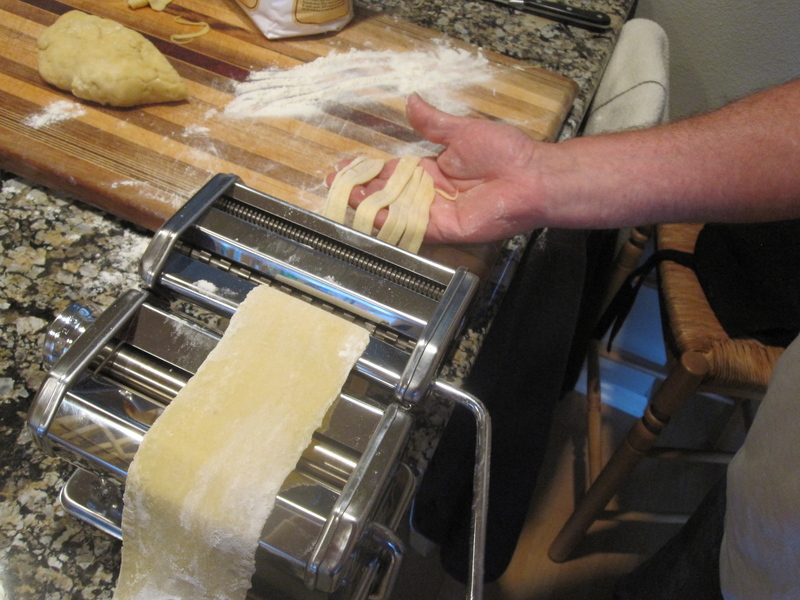 In this case, the box held a bright shiny new pasta maker. I can’t begin to say how tickled I was – still am actually, by this lovely little guy. 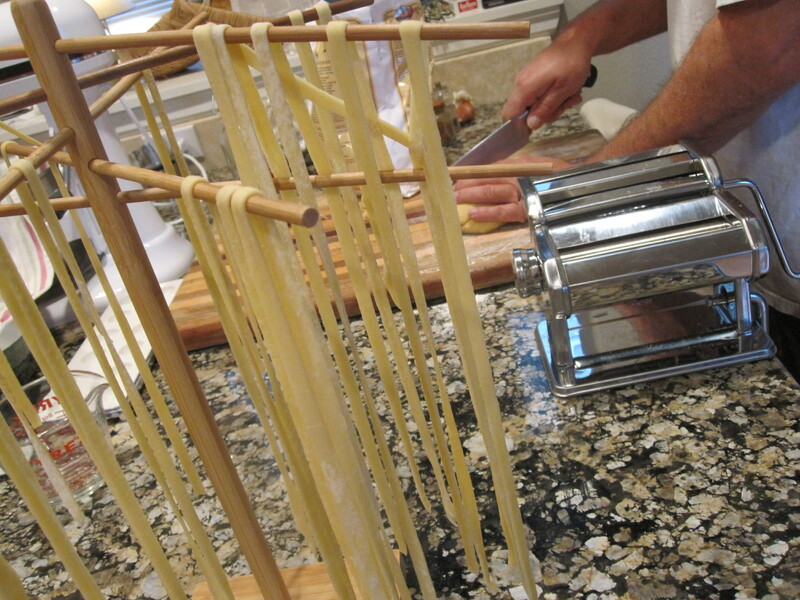 We call him Luigi the Linguine Maker and this guy is good. Ok, I have to admit that if you are simplifying and reducing, a pasta maker is not going to fit in the backpack and rollie. I know that and still, I wanted him. What could be better than making pasta from scratch to go with the luscious tomato sauce my friend and I spent so many hours canning over the summer and the fresh parsley/walnut pesto I made from the dark green Italian parsley the hubs grew in pots on our back deck. 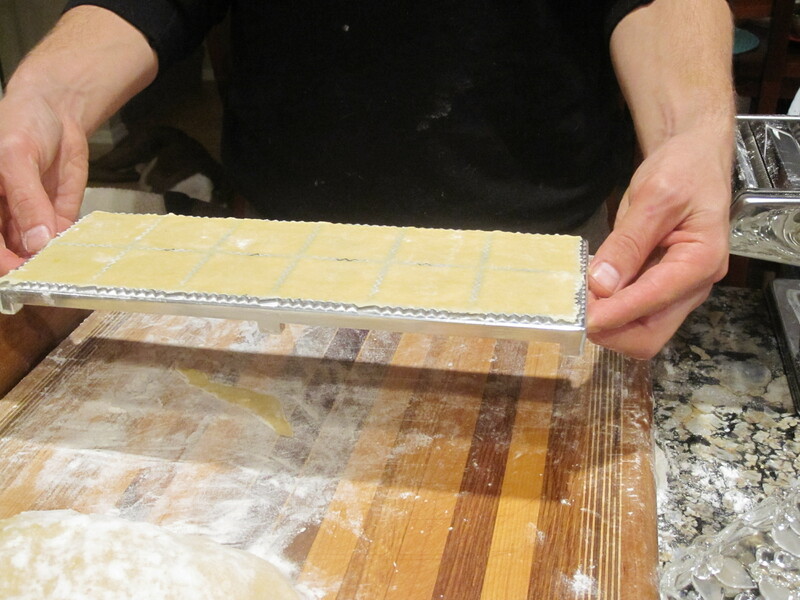 Hand pressing the raviolis – not as easy as your Italian grandma makes it look. I wanted to test this baby out right away, so I invited our son and the birthday girl over to make their own birthday dinner. I’m thinking home-made spaghetti with tomato sauce. They say “Okay, let’s make ravioli”. Oh to be 29 and fearless in the kitchen. So, of course, we made it all. We started at 3 o’clock, stopped to taste a bowl of our fresh fettucine at around 5 o’clock and finally sat down to our birthday feast at 7:30. The final menu? Fresh garden salad, freshly baked foccacia bread, cheese ravioli, delicata squash ravioli, mushroom ravioli with a mushroom cream sauce, tomato sauce, parsley pesto sauce and an olive oil/walnut/fresh parm sauce. “This is the best pasta I have ever eaten!” said my husband, his cheeks bright red from the warm kitchen and two hours cranking the pasta maker. I couldn’t agree more. Four cooks in the kitchen was a crazy dance. Two dogs snoozed just far enough away to keep an eye out for anything tasty that might hit the floor. I was pooped beyond belief. I think we used every pot, pan and dish we owned, but we mastered the art of pasta rolling, sort of mastered ravioli and created a birthday dinner we will always remember. 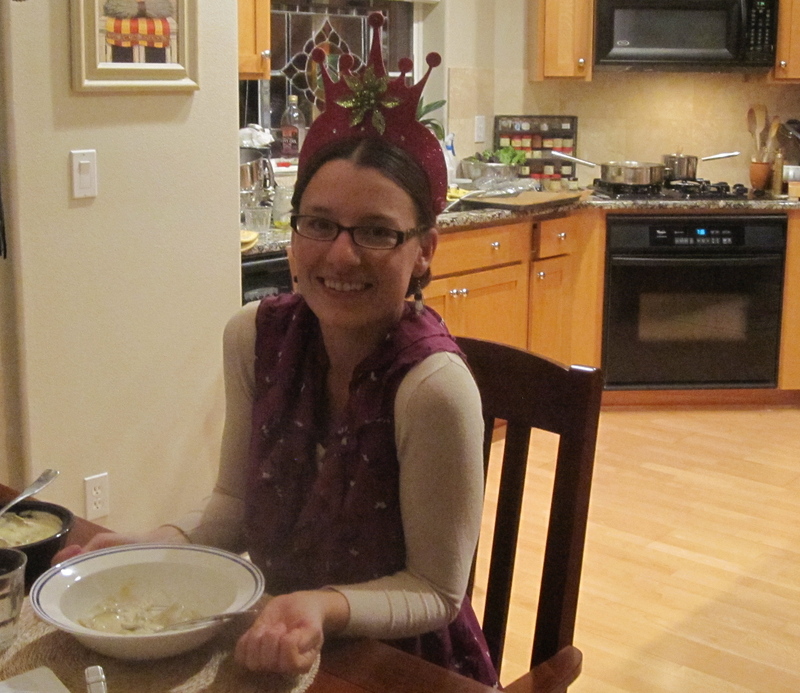 The birthday girl finally sits down to enjoy her favorite – Mushroom ravioli in a mushroom cream sauce and she made it all herself. Yum-o! So, who’s up next for Pasta Night at Casa Sims? The hubs and I have been talking quite a bit lately about eating healthy on a budget. We live in a country with an abundance of cheap, manufactured food of questionable quality and nutritional value. If you like your veggies fresh, not pesticide laden or genetically modified – sorry, but that will hit your pocket big time. Maybe you are lucky enough to have a plot of soil and the willingness to put in the time and effort to exercise your green thumbs. Unfortunately we’re condo dwellers. And that’s why we love living in the Pacific Northwest where we take advantage of the farm fresh bounty. Yes, we pay more. We call it health insurance. But what do you do when you retire and live on a (much) smaller budget and still want to eat well? We’ve been exploring the new/old ways. You know, how people prepared food in the old days before they worked 10 hours a day and drove through McDonald’s on the way home because they had to be somewhere at 7pm. These days it has a hip, trendy name – Slow Food. It’s a movement and apparently we’ve become part of it. We’re suddenly cool because we are doing the things our mothers and grandmothers did every day until General Electric decided that they were wasting time and started creating gadgets to take over their work. Women who spent all of their time working at home were suddenly free! What did they do with all that free time? They went outside of the home to work. This work brought in more money so they could buy more time saving gadgets and because now they didn’t have time to cook an actual meal, they stopped for a pizza. Many of us know how to “heat” or “nuke” but have forgotten how to cook. I had. Of course I married a guy who cooks, but even that was slowly being replaced by eating out or take-out eaten in front of the TV. Slap me silly, but it’s the truth. Watch out what you wish for, because you might just get it. As a child of the 50’s and 60’s and a young woman of the 1970’s I am all for equal rights and equal opportunity and I believe women (and men) should be able to work any darn place they like. But, in our typical American way, if a little is good – a LOT must be better. We’ve worked ourselves into a groove so deep, it’s hard to get out. And not always for the satisfaction of a job well done, but because we needed a bigger house or another TV or (it was always something). And so on and son on, until…something happens and you lose your job or you are forced to retire or you graduate with your fancy degrees and you can’t find a job that pays enough to cover your student loans. You’re in deep doo doo Donald! Like the Broadway play Stop the World I Want to Get Off, it’s all been kinda spinning beyond our control. What seemed like such a good idea at the time has somehow morphed into Dante’s Inferno. Ok, I’m exaggerating, but as we’ve been looking at the reality of living the rest of our lives with a lot less, I’m just starting to realize that I sacrificed so much in the name of stuff. Stuff that is now being given to the Goodwill or sold on ebay or piled into the weekly trash bin. As far as I know, nobody get’s a do-over on their life. I’m just glad that we have been given this opportunity to explore the other side – not just the slow food movement but the slower life movement. We’re working less and making less, but we’re savoring it more. We have time to cook and share food – home grown, home canned, and home-made with friends and family. Some of you figured this out a long time ago. We’re late bloomers. My husband’s fondest memories are from the 1970’s when he lived in a small beach town in Massachusetts. Life was simple – focused on family, friends and community. Entertainment was free – a pickup baseball game or board games and they traded their homegrown harvest for fresh caught lobster. Did we really give that up for a 45″ HD TV and think we traded up? 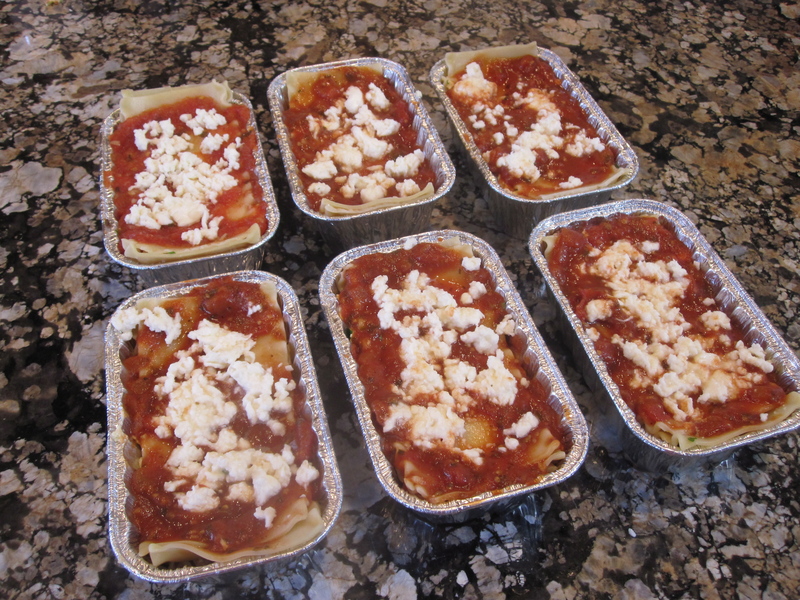 As I sat here writing this post, my favorite chef was downstairs making up meal sized batches of lasagna with ingredients left over from our cooking marathon, pasta making, cheese making, birthday celebration yesterday evening. Does it get any better? Not much! We’re grateful for our bounty. Yes, it’s finally summer in the beautiful Pacific Northwest. Community gardens, urban farm plots and farmer’s markets are bursting with delicious bounty. It’s my absolute favorite time of year. Berries of all kind, cherries sweet and tart. My fingertips are stained a dark purplish hue from July through August. I always have big plans for the box loads of berries I buy every week, but mostly I eat them all by myself before they make it into a pie or cobbler or jam. Last year the hubs and I did manage to distill a very tasty Framboise. A liqueur made with vodka and fresh raspberries. This year we’re going big and bottling it for Christmas gifts. Way better than jam! But, summer also brings on zucchini. Lots and lots and lots of zucchini. Oh, its fun at first, but pretty soon zucchini starts to take over. You’ve eaten it every day for weeks and frankly, enough already with the zucchini – but it just keeps coming. Now you start giving it away to your friends and family who don’t have gardens of their own – the pastie-white apartment and condo dwellers with no hint of a farmers tan or dirt under their nails. At first they’re excited, grateful even, for this unexpected gift. But it doesn’t take long and soon even these folks are dodging you and your gifts from the garden. It’s been said that zucchini is the gifted fruitcake of vegetables. So, with my new frugal retiree outlook on life, I’ve been on the hunt for new ways to use this little over achiever (besides trying to give a bag of it to the gas station attendant for filling up the gas tank). Interesting side note: August 8th is officially Leave Zucchini on Your Neighbor’s Porch Day. Why not plan an entire meal around zucchini? With all of the fabulous food blogs out there, it wasn’t hard to come up with a whole bunch of creative recipes. Here’s my menu plan. Sounds like a dinner party’s in the works at Casa Sims in the next couple of weeks. Start with a pitcher of zucchini martinis and spicy zucchini chips, and you’ve got cocktail hour covered. For the main course, I’m thinking this zucchini bread pudding looks absolutely delish. Pair it with a zucchini carpaccio salad and this whole menu plan just keeps getting better. Finish it all off with a scoop of zucchini ice cream. I’m thinking a few raspberries on top cuz I’m pretty sure even zucchini goes better with raspberries. Call me crazy (you won’t be the first) but this sounds like a deliciously fun dinner to me. Summer’s better tasting version of when we used to make the entirely green dinner on St. Patrick’s Day. I’ve book-marked the recipes and I’m going for it. Who wants to join us? 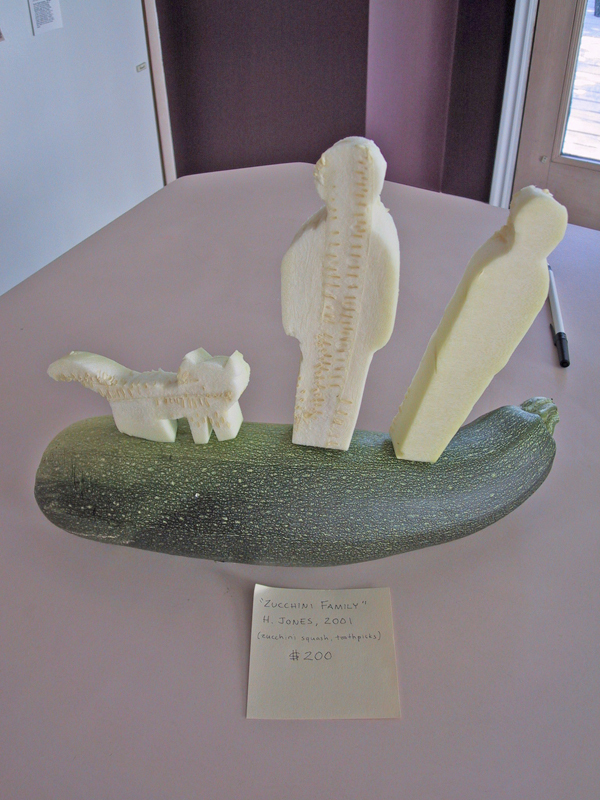 Now, if you still have more zukes than you know what to do with, here are a couple of other interesting ideas. 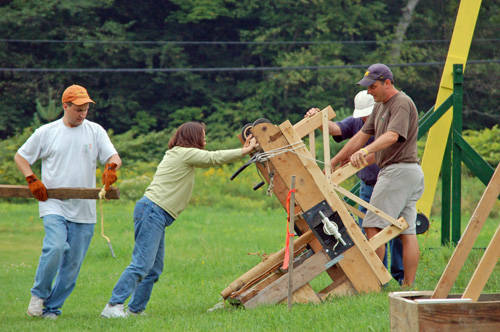 Yes, folks, its the Zukapult Competition. Really, what’s better than flying zucchinis? Zuke Art? Sure, why not…but would anybody really buy this for $200? Disclaimer: I’m one of the pastie condo dwellers and all of my garden bounty including the zukes are gifts from the beautiful gardens of my son and his farmgirl. Thanks for sharing your bounty with us. This was our third adventure in eating a “free” dinner and, no, it wasn’t at the soup kitchen. I used to joke about when we’d become “old” people having to eat the early bird special at Denney’s, but my hubby and I have found one secret to a free and fun evening out that includes multiple samples of tasty, fresh, local and often organic foods, wine, champagne and dessert in a festive atmosphere with a great group of friends and neighbors. Here in Portland we are blessed with a local Whole Foods (but much better) type of market known as New Seasons. Our local NS has a wine bar and we’re not alone in stopping for a glass of something red while cruising the aisles on our weekly grocery outing. The folks at New Seasons are very community minded offering weekly classes on health, lifestyle and nutrition as well as Friday game nights, but the best kept secret in town is First Thursday. Tonight we sampled, six types of ham (it’s Easter weekend), pasta with a raw asparagus pesto (yum!) four flavors of soft sheep cheese from a local maker, grilled marinated lamb, two types of sausage, grilled asparagus on focaccia, a tasty melon salad, goat cheese/chocolate truffles and french toast with fresh whipped cream and strawberries and blueberries. But wait, there’s more! We also sampled several local wines, a local beer, a prosecco and a bellini. Yes, we were toasty and our tongues were dancing from all the great tastings. Good food, friendly people, walking distance from home and FREE. I can’t think of a better way to spend a Thursday evening. I’m already looking forward to next month. Salut!